When bassist Daniele Piccinini left the prog / jazz group Accordo dei Contrari in 2014 after recording AdC, he and guitarist Gabriele Martelli (PropheXy) were persuaded by a mutual friend to put together a new band and explore improvised progressive psychedelic instrumental music. They jumped at the idea and added drummer Roberto Bernardi. After honing their sound they entered the studio in 2016 to record the nine tracks on Inner Gobi. Inner Gobi is one fantastic album featuring a multitude of shades and moods. The nightmarish cover art with the cluster of frog eggs — or are they eyes? — menacing the running man under a full moon gives you some idea of the mood on the disc. The album opens with “Ego Loss,” a pure slice of avant-prog, odd time signatures, and dissonance that kicks into high gear at its mid-point. The title track starts as a nightmarish dissonant instrumental that develops into a melodic ethereal guitar solo much like Pat Metheny. Then “Slidin’ Bikes” takes us in a new direction with moody bass and guitars playing different melodies that complement each other, eventually joining in a common riff. “The Endless Day of Robby the Ant” is a great song title of outstanding prog rock, doubled guitar lines, synth solos, and an ending that integrates Roy Batty’s iconic Bladerunner C-Beams Speech. “Moth” opens with wordless choral music that becomes supplanted by Frippian guitar work with robust psych-prog riffing and obvious King Crimson influences. Another great song title and instrumental is “Sorry Son … (I’ve Lost Your Car)” with outstanding drumming and superb prog-jazz fusion. “Moonshine” integrates a bit of funk with melodic prog rock. “Seppuku” is a harsh prog rock boogie. And the album closes with “Viking,” another stellar prog fusion instrumental and great guitar solos. “Viking” actually ends after about seven minutes, followed by three minutes of silence, when suddenly there are a few chords, drums, and lots of laughter. 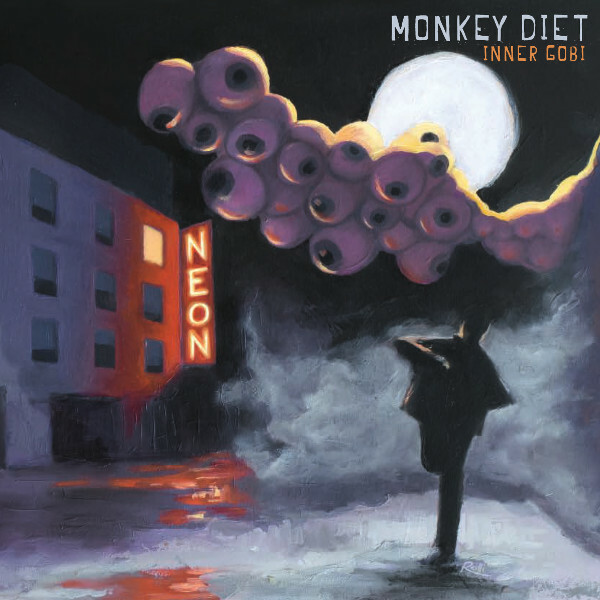 Monkey Diet is definitely a band to watch!